A rich cream made with Hyaluronic Acid/Protein, to help skin protect against moisture loss. This product can be applied to the throat area and can be used day or night and under make-up. 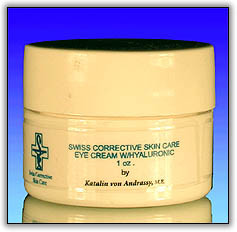 Cleanse facxe and apply a thin layer around the eyes, pat gently. DO NOT LET PRODUCT GO INTO THE EYES. Deionized Water, Glyceryl Stearate PEG-100 Stearate, Safflower Oil, Glycerin, Stearic Acid, Cetyl Alcohol, Dimethicone, Propylene Glycol, Aloe Vera, Hyaluronic Acid, Jojoba Oil, PCA, Tocopherol, TEA, Diazolidinyl Urea, Panthenol, Retinyl Palmitate, Methylparaben, Propylparaben, Diazolidinyl Urea, Quaternium-15.